I think every person, at some point in their lives, will look up to the vast sky and be filled with a sense of wonder. Like, how does it all work? What’s it like to live in space? And are we really alone in the universe? Indeed, there are many things to learn (and imagine) about the final frontier. If your elementary school-age kids are showing signs of interest in outer space, you should check out Grandpa in Space by Fairlady Media. The newest addition to the Granda & Grandma apps series (which we adored), Grandpa in Space is a fun, space-themed app in which kids travel to nine destinations in our solar system alongside a kindly grandpa. Along the way, they also participate in 10 mini games that strengthen foundation skills such as counting, matching, sorting, performing additions, reading, and memory. To play, kids first select the planet they want to travel to. Before they go, they can read up on fun facts about their selected planet; for example, how Jupiter has 67 moons or how Venus has many volcanoes on its surface. Then, they build a rocket by dragging and dropping the desired parts onto a blueprint. Once the rocket is completed, it’s time to blast off into space. The cockpit window provides a glimpse at various space objects outside, but kids are not expected to just sit still and enjoy the view. Instead, they are asked to complete a variety of educational mini games. Being in space, kids will find activities such as fixing broken satellites, sorting space junk into the correct trash bins, and blasting asteroids by counting by 1’s, 2’s, 5’s, or 10’s. They also get to send aliens to their home planets by matching opposite words, add up alien legs, and compete in a UFO race by finding word rhymes. 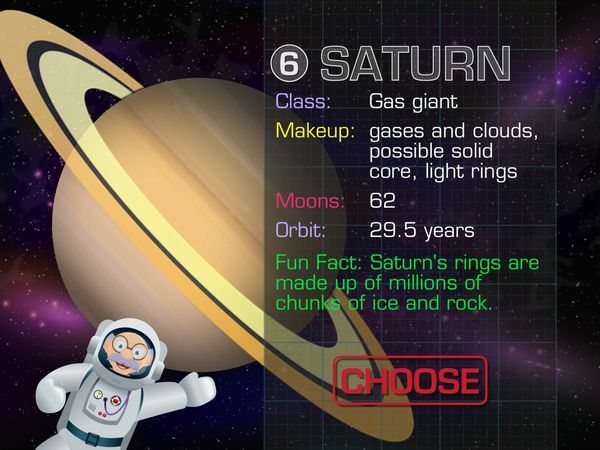 The app also includes 18 educational videos about the planets and astronaut training. These videos are made with real footage from NASA, and are narrated by grandpa himself. Once kids have completed the mini games and watched the videos, they will get a high-five from grandpa, plus a souvenir for the trip. They then return to Earth, where they can prepare for their next space travel. In Grandpa in Space, Pluto can be selected as one of the nine destinations in our solar system. However, the app also touches upon how it is no longer classified as a planet. Including this interesting detail, the app has more than 30 facts about the planets incorporated throughout the game. It should be noted that while the app is specifically targeted at kids ages 5–8, some of the mini games are simpler, and may appeal to younger juniors. Parents can customize which mini games are active from the protected Settings menu. The app does not contain ads or in-app purchases. There are links to the developer’s other apps, but they are placed within a protected section for parents. Having liked the other Grandpa & Grandma apps, it was easy for me to enjoy Grandpa in Space. It’s a solid app that successfully balances education and entertainment. I really enjoyed learning about the planets in our solar system alongside the ever-so-charming grandpa, whose voice actor deserves high praise for providing this unique character with a warm and compelling personality. The games themselves are engaging. With ten games in the rotation (and many topics to cover), there is no room for kids to be bored. Each game also cleverly reinforces an educational topic through play. I think the best part of the app, however, is the astronaut training videos. While short, they allow kids to imagine what astronauts do, and what’s it like living in space. Even as an adult, I found them truly eye-opening. I believe that kids will be intrigued to learn more about outer space after using this app. Grandpa in Space is a thrilling app that lets kids learn about our solar system, and build basic math and reading skills through 10 space-themed mini games. The app depicts our solar system realistically, and planets look real as they swirl in the darkness. A fascinating feature is the inclusion of videos made with actual footage from NASA that depict the lives of astronauts in space. Overall, it’s a great learning tool for kids ages 6–8, but even adults can pick up a thing or two from this app.